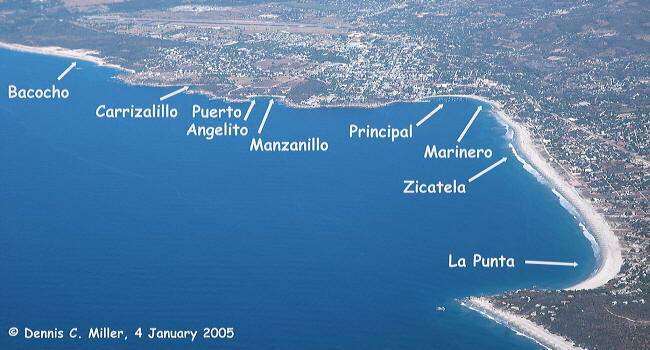 All of Puerto Escondido's beaches are shown on this aerial photo. Zicatela is known for its waves, home of the famous "Mexican Pipeline". It is ranked as one of the top surfing beaches in the world. Surfers(and tourists watching the surfers) from all over the world can be seen every day. La Punta is at the southeast end of Zicatela. 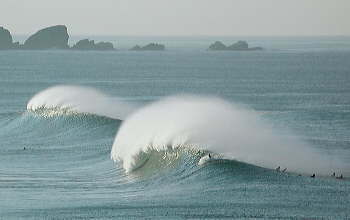 The waves are often smaller than at Zicatela. René Salinas at Central Surf usually teaches his surfing lessons at La Punta. The beach is flat, hard packed, and excellent for jogging. 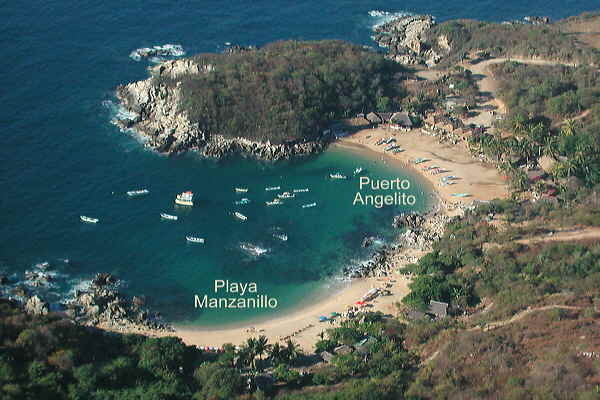 Puerto Angelito and Playa Manzanillo are separated by a rock outcrop. It's an easy walk or swim to go from one to the other. Manzanillo is only a five minute walk from Eglantina. Both are protected from big surf, and are excellent for swimming and snorkeling. Playa Principal is the closest beach to the main town area. Numerous restaurants and shops parallel the beach. Lanchas, or "water taxis" can take you to Puerto Angelito, Playa Manzanillo, or Carrizalillo. Playa Marinero is between the sheltered waters of Playa Principal and the famous surf of Zicatela. It's just a few minute walk to either Playa Principal or Zicatela. Under most conditions, it's a great beach for boogie boarding and body surfing. Bacocho is a beautiful stretch of unspoiled beach, but often unsafe for swimming. 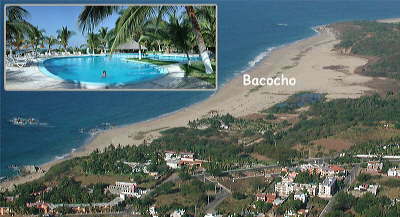 Villa Sol and Best Western Posada Real hotels have "beach clubs" on Bacocho, accessible to the public for a nominal fee. The atmosphere and setting of the Villa Sol "beach club" is equal to or surpasses anything I've seen in Hawaii or the Caribbean. 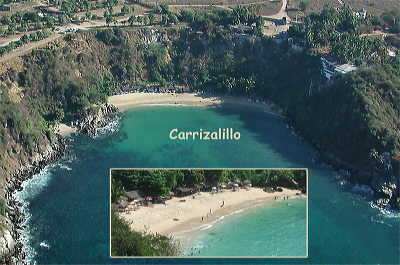 Carrizalillo is usually protected from big surf, and is excellent for swimming and snorkeling..